Sappiness is fair game on Valentine’s Day. Over marketed or not, it’s nice to have one day a year where you can be a schmaltzy, lovey-dovey goon, and not many people will give you the stink eye. 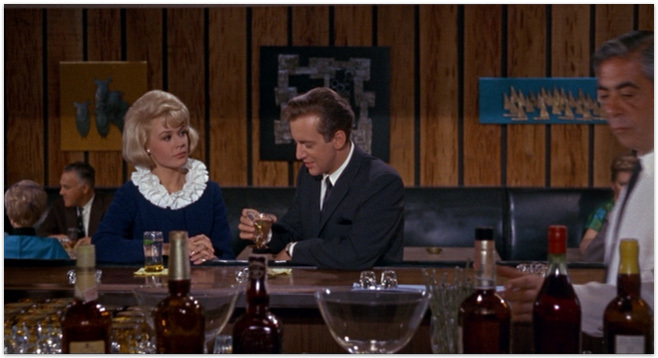 I’ll admit, I’m not typically much of a Sandra Dee and Bobby Darin fan, but That Funny Feeling is a cute, albeit silly, romantic comedy that gets more than a pass on Valentine’s Day- it gets watched! And I enjoyed it. Bring on the corny 1960s escapist rom coms! Joan Howell (Sandra Dee) is a hard-working maid, er, excuse me, actress, who just works for a cleaning service until she gets her big break. 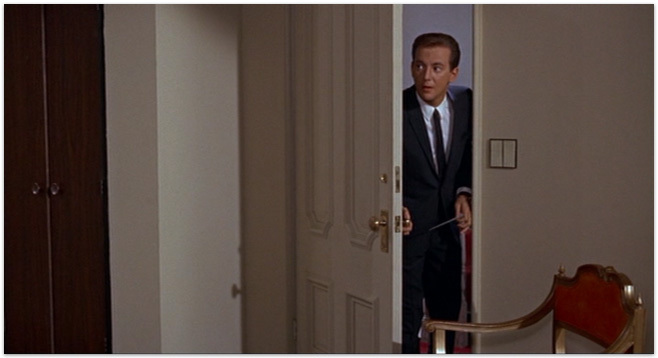 When one of her clients, who has never met her, leaves a note saying he’ll be out of town for a week, she decides to take a break from her cramped apartment and live the high life until Mr. Milford (Bobby Darin) returns from California. 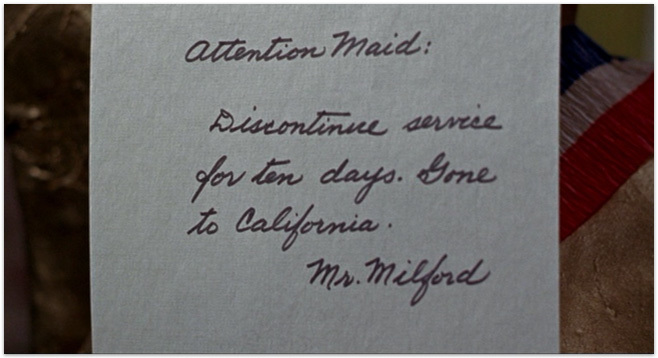 But the funny thing is, Joan goes on a date with Mr. Milford without realizing the apartment she’s staying in is his, so when he brings her back to her place, or should I say his place, his curiosity is piqued. Why is this nice, seemingly innocent girl lying to him, and how did she get into his apartment? 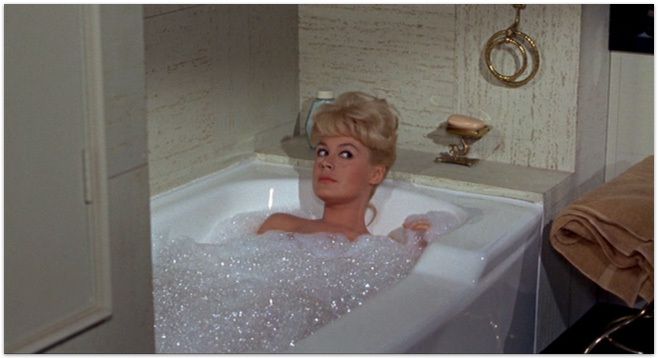 He decides to let her ruse continue, pretending that he lives in the fancy apartment of his boss, Harvey (Donald O’Connor), until he can figure out what Joan’s gig is all about. Of course, in the meantime, they fall in love with each other and worry about someday confessing their lies to one another. I wondered if I’d be able to watch such a cheesy movie and thoroughly enjoy it, as I can certainly be a snobby movie watcher and only enjoy super corny flicks if they star my personal favorites, like Ginger Rogers and Fred Astaire. I gave That Funny Feeling a chance, even though I was cringing for the first few minutes, and sure enough- I got sucked in and completely enjoyed all ninety-three minutes of outrageous comedic scenarios and over-the-top acting. Sure, the plot isn’t very believable, but it’s still pretty funny, and much more entertaning (in my opinion) than modern takes on the story, such as Maid in Manhattan with Jennifer Lopez. I loved the silly, wide-eyed jokes that hint towards sexual scenarios that nowadays you’d expect to be more like major plot elements, not just winks at the member of the audience in the know. It’s refreshing to have an innocent take on such things, even if it was probably unrealistic even for 1965. (I mean, come on, the sexual revolution was about to begin! People weren’t ignorant on the matter.) I loved the costumes, the sets, and Dee and Darin actually have a sweet sort of chemistry on film, which I suppose is no surprise considering they were married for s short time in real life. So, if you’re looking for a fun and innocent little romantic comedy to enjoy this Valentine’s Day, why not enjoy That Funny Feeling, but be careful you don’t get a cavity, okay? I really enjoy reading your movie reviews! Yeah, he totally is! That’s why movies featuring people known for singing are usually not known for the award-winning acting! hehe But still very enjoyable. I’ll have to check that one out! The only movie I’ve seen with both of them is “If a Man Answers” which is quite silly, but a lot of fun! 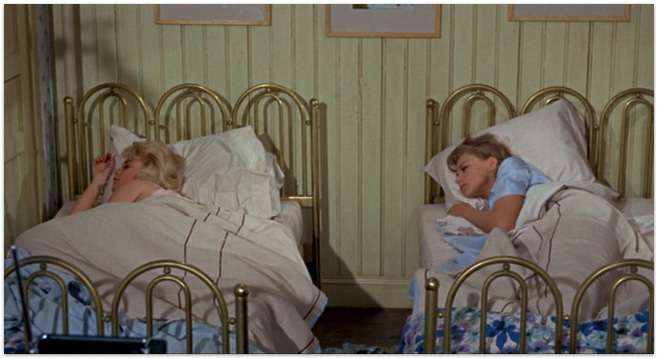 Sandra Dee plays a young woman married to a photographer (Bobby Darin) who is constantly surrounded by models, which makes her feel a little insecure about his fidelity. She and seeks advice from her mother who then gives her a book on how to “train” her husband…but its basically a dog training book. Her mother tells her that the same rules apply to men. It is cute and sweet and they both had a nice chemistry in this film. Have I mentioned how much I like all your movie reviews. I watched Fritzwilly the other day after hearing about it on your blog and loved it. There are several other movies you’ve talked about I’m putting on my “to watch list” too! Yey! I have always adored this movie and need to see it again! It has probably been 10 years since the last time I did so. I’m sorry to hear you aren’t much of a Sandra Dee/Bobby Darin fan. :( I love them. 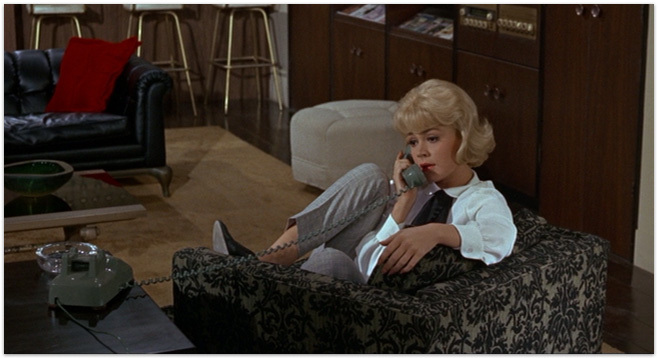 My favorite fashions have always been worn by Doris Day & Sandra Dee. She’s so adorable. 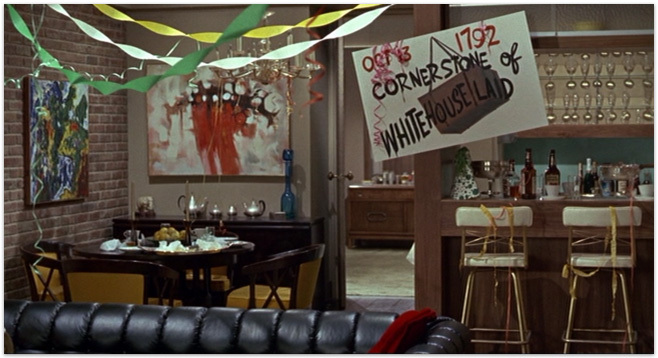 Do you know if this movie from the street scene is a set or the real thing?